Pope Francis has decried the grave injustices perpetrated against the thousands of migrants fleeing poverty and violence and condemned the trafficking of human beings. Celebrating Mass in Ciudad Juárez, the last public event of his Mexican visit, the Pope spoke of the global phenomenon of forced migration. “Here in Ciudad Juárez, as in other border areas – he said – there are thousands of immigrants from Central America and other countries, not forgetting the many Mexicans who also seek to pass over “to the other side”. Each step, a journey laden with grave injustices: the enslaved, the imprisoned and extorted; so many of these brothers and sisters of ours are the consequence of a trade in human beings”. 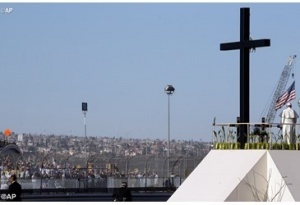 The Pope’s homily came during a Mass in the Fair area of Juárez City filled with over 200,000 faithful. He was also reaching out to the more than 30,000 faithful participating in the event thanks to a live-stream of the ceremony being broadcast in a football stadium just across the border in the West Texas city of El Paso. In this text we find ourselves before the mystery of divine mercy. Mercy, which always rejects wickedness, takes the human person in great earnest. Mercy always appeals to the latent and numbed goodness within each person. Far from bringing destruction, as we so often desire or want to bring about ourselves, mercy seeks to transform each situation from within. Herein lies the mystery of divine mercy. It seeks and invites us to conversion, it invites us to repentance; it invites us to see the damage being done at every level. Mercy always pierces evil in order to transform it. Jonah helped them to see, helped them to become aware. Following this, his call found men and women capable of repenting, and capable of weeping. To weep over injustice, to cry over corruption, to cry over oppression. These are tears that lead to transformation, that soften the heart; they are the tears that purify our gaze and enable us to see the cycle of sin into which very often we have sunk. They are tears that can sensitize our gaze and our attitude hardened and especially dormant in the face of another’s suffering. They are the tears that can break us, capable of opening us to conversion. Here in Ciudad Juárez, as in other border areas, there are thousands of immigrants from Central America and other countries, not forgetting the many Mexicans who also seek to pass over “to the other side”. Each step, a journey laden with grave injustices: the enslaved, the imprisoned and extorted; so many of these brothers and sisters of ours are the consequence of a trade in human beings. We cannot deny the humanitarian crisis which in recent years has meant migration for thousands of people, whether by train or highway or on foot, crossing hundreds of kilometres through mountains, deserts and inhospitable zones. The human tragedy that is forced migration is a global phenomenon today. This crisis which can be measured in numbers and statistics, we want instead to measure with names, stories, families. They are the brothers and sisters of those expelled by poverty and violence, by drug trafficking and criminal organizations. Being faced with so many legal vacuums, they get caught up in a web that ensnares and always destroys the poorest. Not only do they suffer poverty but they must also endure these forms of violence. Injustice is radicalized in the young; they are “cannon fodder”, persecuted and threatened when they try to flee the spiral of violence and the hell of drugs, not to mention the tragic predicament of the many women whose lives have been unjustly taken. Let us together ask our God for the gift of conversion, the gift of tears, let us ask him to give us open hearts like the Ninevites, open to his call heard in the suffering faces of countless men and women. No more death! No more exploitation! There is still time to change, there is still a way out and a chance, time to implore the mercy of God. This time for conversion, this time for salvation, is the time for mercy. And so, let us say together in response to the suffering on so many faces: In your compassion and mercy, Lord, have pity on us … cleanse us from our sins and create in us a pure heart, a new spirit (cf. Ps 50). I would like to take this occasion to send greeting from here to our dear sisters and brothers who are with us now, beyond the border, in particular those who are gathered in the University of El Paso Stadium; it’s known as the Sun Bowl, and they are led by monsignor Mark Seitz. With the help of technology, we can pray, sing and together celebrate the merciful love that the Lord gives us and that no border can stop us from sharing. Thank you brothers and sisters at El Paso of making us feel like one family and one, same, Christian community.